A biomarker is a molecular signature found in blood, other body fluids, or tissues that reflects a normal biologic process, pathogenic process or pharmacologic process to a therapeutic intervention. A biomarker that has been shown to have clinical validity and utility can be used to identify the earliest stages of disease onset, diagnosis, prognosis, efficacy of a specific drug therapy, toxicological effects of a drug, or disease risk. Cortisol is a stress hormone produced by the adrenal gland; it’s secretion is increased during times of stress. Several studies have linked chronic stress and risk for cardiovascular disease risk, which includes heart attack, chest pain, stroke, high blood pressure and heart failure [4-5]. Cortisol is usually measured in saliva, serum or urine, all of which measure cortisol levels in the last few hours to days and thus don’t reflect the stress response over a prolonged period of time. In contrast, hair analysis provides a long-term measurement of cortisol production; cortisol can be incorporated into hair and remain stable for at least a 6 month period (corresponding to the proximal 6-cm of a human hair sample). In 2007, twenty-five healthy pregnant women were evaluated for perceived stress and cortisol levels in hair . Maternal hair cortisol was found to be a potential biomarker of chronic stress in pregnancy, as it correlated positively and significantly with measures of perceived stress. In the present study, a larger cohort of 112 patients was used to evaluate the hypothesis that chronic stress, as assessed by hair cortisol content, is associated with the development of acute myocardial infarction (i.e. heart attack). Although acute stress is increasingly recognized as a contributing factor to acute myocardial infarction (AMI), the role of chronic stress has been less clear. Patients in the current study were divided into two groups of 56 male subjects above the age of 18 years that underwent hair sampling: a control group and an AMI group. The control group consisted of patients admitted to an internal medicine ward for reasons other than acute coronary syndrome or stroke. The AMI group consisted of patients admitted to the Intensive Cardiac Care Unit at the Meir Medical Center in Kfar-Saba, Israel who were suffering from heart attacks, specifically either ST-elevation or non-ST elevation AMI — this corresponds to the S-T segment on an electrocardiogram (during ventrical systolic depolarization, i.e. when the cardiac muscle is contracted). AMI was defined as the combination of elevated circulating levels of cardiac biomarkers — either troponin or creatine kinase and its MB isoenzyme — with typical chest pain lasting for at least 30 min or typical electrocardiogram changes. None of the study’s participants were admitted to the hospital in the 3 months prior to the study and none of the patients died in either the control or AMI group. The study evaluated the prevalence of diabetes, hypertension, smoking and family history of coronary artery disease — all risk factors for AMI — between the control and AMI group, but failed to find a difference. However, the AMI group had more cholesterol problems. The researchers found that hair cortisol concentrations in the proximal 3-cm segments of the AMI patients, which corresponds to the last three months, were significantly higher that those of controls. When they looked closer at the AMI patient samples, they were unable to find a difference between hair cortisol levels in the first 1.5-cm and second 1.5-cm segments. When the entire study population (a combination of both control and AMI patients) was divided into quartiles (i.e. 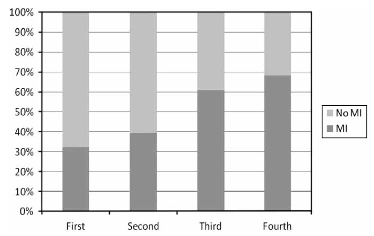 dividing the data set into four equal parts so that each part represents one-fourth of the sampled population), the occurrence of AMI increased with hair cortisol concentration (see figure). The scientists then conducted an analysis using multivariate logistic regression. Logistic regression is a statistical model used for prediction of the probability of occurrence of an event, using predictor variables that may be either numerical or categorical. Their model included factors known to affect the risk for AMI, including age, LDL and HDL cholesterol, BMI, smoking status, previous myocardial infarction, and log-transformed hair cortisol. Only hair cortisol concentrations correlated with AMI. There are several limitations with this study. First, the analysis only evaluated male patients. AMI is more prevalent in men than women and as there are hormonal differences between men and women, the results should not be applied to females. Second, the study population was small and will need to be corroborated in larger studies. Third, there are limitations to the measurement of cortisol in hair, including length, contamination, and affects of environmental, ethnic and nutritional factors. The researchers also suggest that AMI may be preceded by an escalating restriction in blood supply in the days to weeks prior to a heart attack and thus may have caused stress (rather than stress causing a heart attack). However, the finding that the level of hair cortisol in AMI patients was not statistically different between the first and second 1.5-cm, corresponding to the months leading up to a heart attack, supports the view that hair cortisol levels are a marker of chronic rather than acute stress. Fourth, the study did not consider psychosocial stress nor whether the stress was of physical or emotional nature. Lastly, the study does not address the question of whether, within the group of patients at high risk for a heart attack, the degree of stress would be associated with an increased risk to actually develop a heart attack. Intuitively we know stress is not good for you, but it’s not easy to measure. We know that on average, hair grows one centimetre (cm) a month, and so if we take a hair sample six cm long, we can determine stress levels for six months by measuring the cortisol level in the hair. Stress is a serious part of modern life affecting many areas of health and life. This study has implications for research and for practice, as stress can be managed with lifestyle changes and psychotherapy. This study demonstrates a novel technique to quantify the accumulation of cortisol in hair over time and suggests that hair cortisol can be used as a biomarker for chronic stress. This study further suggests that cortisol levels are elevated prior to the clinical manifestation of coronary heart disease, supporting the theory that chronic, long-term stress is not healthy and may result in the increased risk for coronary artery disease. Rosengren et al. Association of psychosocial risk factors with risk of acute myocardial infarction in 11119 cases and 13648 controls from 52 countries (the INTERHEART study): case-control study. Lancet. 2004 Sep 11-17;364(9438):953-62. Aboa-Eboule et al. Job strain and risk of acute recurrent coronary heart disease events. JAMA. 2007 Oct 10;298(14):1652-60. Steptoe et al. Effort-reward imbalance, overcommitment, and measures of cortisol and blood pressure over the working day. Psychosom Med. 2004 May-Jun;66(3):323-9. Reynolds et al. Elevated fasting plasma cortisol is associated with ischemic heart disease and its risk factors in people with type 2 diabetes: the Edinburgh type 2 diabetes study. J Clin Endocrinol Metab. 2010 Apr;95(4):1602-8. Epub 2010 Feb 3. Kalra et al. The relationship between stress and hair cortisol in healthy pregnant women. Clin Invest Med. 2007;30(2):E103-7. Hair provides proof of the link between chronic stress and heart attack. Western News press release, The University of Western Ontario. 2010 Sep 3.